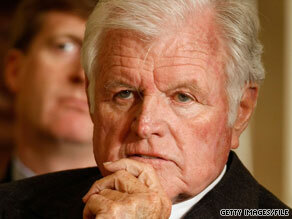 (CNN) -- Shortly before he died from brain cancer, Sen. Ted Kennedy wrote a letter to Pope Benedict XVI. President Obama delivered the letter to the pontiff during his visit to the Vatican in July. Sen. Ted Kennedy wrote to Pope Benedict XVI, asking the pontiff to pray for him as he dealt with cancer. "Most Holy Father, I asked President Obama to personally hand-deliver this letter to you. As a man of deep faith himself, he understands how important my Catholic faith is to me, and I am so deeply grateful to him. I hope this letter finds you in good health. "I pray that you have all of God's blessings as you lead our Church and inspire our world during these challenging times. I am writing with deep humility to ask that you pray for me as my own health declines. I was diagnosed with brain cancer more than a year ago, and although I continue treatment the disease is taking its toll on me. I am 77 years old, and preparing for the next passage of life. "I have been blessed to be part of a wonderful family. Both of my parents, particularly my mother, kept our Catholic faith at the center of our lives. That gift of faith has sustained and nurtured, and provided solace to me in the darkest hours. "I know that I have been an imperfect human being, but with the help of my faith I have tried to right my path. I want you to know Your Holiness that in my nearly 50 years of elective office, I have done my best to champion the rights of the poor and open doors of economic opportunity. I have worked to welcome the immigrant, to fight discrimination, and expand access to health care and education. I have opposed the death penalty, and fought to end war. Those are the issues that have motivated me and been the focus of my work as a United States Senator. "I also want you to know that even though I am ill, I am committed to do everything I can to achieve access to health care for everyone in my country. This has been the political cause of my life. I believe in a conscience protection for Catholics in the health field, and I'll continue to advocate for it as my colleagues in the Senate and I work to develop an overall national health policy that guarantees health care for everyone. "The Holy Father has read the letter which you entrusted to President Obama, who kindly presented it to him during their recent meeting. He was saddened to know of your illness, and asked me to assure you of his concern and his spiritual closeness. He is particularly grateful for your promise of prayers for him, for the needs of our universal church. "His Holiness prays that in the days ahead, you may be sustained in faith and hope, and granted the precious grace of joyful surrender to the will of God, our merciful father. He invokes upon you the consolation and peace promised by the risen savior to all who share in his sufferings, and trust in his promise of eternal life. "Commending you and the members of your family to the loving intervention of the Blessed Virgin Mary, the Holy Father cordially imparts his apostolic blessing as a pledge of wisdom, comfort, and strength in the Lord."